She's not a warrior of course, but her tattoos are for real. 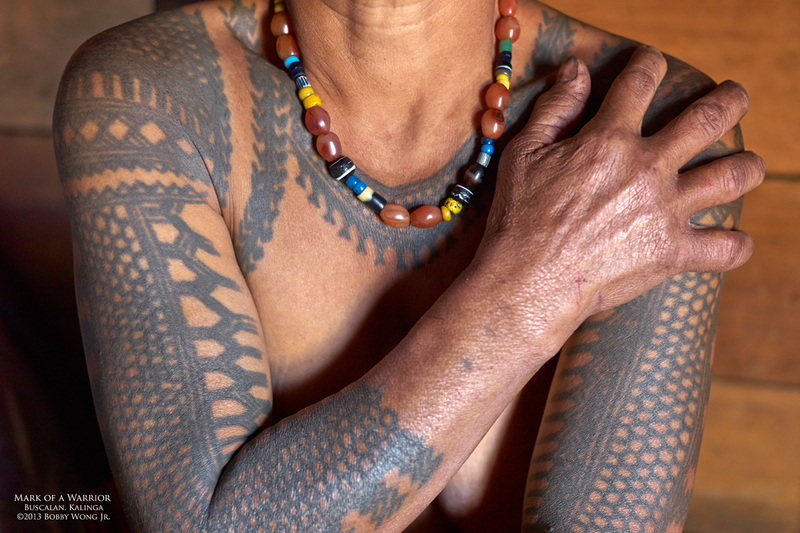 They're body art practiced by the tribes in the province of Kalinga. Real warriors wear them to ward off evil or commemorate their bravery. And their women wear them too. They're head-hunters after all, although that practice has ended in the middle of the last century. The women wear beads handed down from generations, and wear tattoos to look beautiful to their men. But this practice is a vanishing tradition as the younger generations no longer adorn their bodies this way. The women we photographed are in their 70's, with several near the age of 100. That's why we are racing to photograph as many as we can... before they are all gone. Enjoy.